Is your business past due for a content audit? If your business is like most of those operating on the Web these days, you’re probably generating massive amounts of content. That means that you’re busy adding to the content on your site in the never-ending struggle to keep your business alive, relevant, and current. So you might not have taken the time to look at your old content. This is called conducting a content audit, a term you’ve probably heard a lot about lately. As you and your team are actively engaged in creating content, you’re continually refining (by nature) it as well as defining your voice as a brand. It’s an evolution, really. That means your old content needs to be critically re-evaluated on a periodic basis. By looking back at your old content, with the benefit of what you’ve learned in the time since you created it, you can see what elements of it aren’t working. Conversely, you might be surprised. Your old content might be conducting better than your latest, greatest. But you won’t know the state of your content without conducting a content audit. Here are five tips on how to conduct a content audit. The core purpose of a content audit is, of course, to grow your business. But that’s not a specific goal. You have to go into a content audit with a clear goal in mind. Do you want more traffic? More leads? Increased conversions? A little bit of everything? All of those are admirable motivations, but you need to outline the desired outcome, whatever it may be, before you begin a content audit. That way you’ll know what you’re looking for during the audit. The biggest obstacle in planning a content audit is figuring out how it will be done. This has a lot to do with what the structure and complexity of your content. If you have a robust website that employs third-party hosts, content management systems (CMS), offsite databases, and multi-user access, it can become a small miracle just to pull all the data together. Before you can begin the content audit, you need to have the people and resources in place to be able to pull all of that data together. That can mean interfacing with multiple departments and outside vendors in order to gather all the data. The first step in conducting a content audit is to catalog your content – all of it. That means you should create a spreadsheet that lists every blog post, landing page, success page, and product or service pages, which can become a daunting prospect if you have a ton of content to sift through. If your site is small, you can manually create a spreadsheet in Excel or Google Sheets. If you have literally thousands of pages and posts, you might want to consider using an automated crawling tool to help you catalog your content. One you’ve cataloged your content, you need to assess the success of each page. To do this, you’ll want to use your analytics tools (Moz, Google, HubSpot, etc.). You probably already pay attention to your web analytics on an on-going basis, but looking at it in totality can be eye-opening. During the content audit, you’re mission is to gain a deep insight into what is working on your site, and shape all the other content to be more like it, while continuing to add new content that fits the mold. This is fairly obvious. What pages get the most hits? Is it always the newer pages? Is there a two year old blog post that gets more hits that the rest of the site combined? If so, it’s time to look at the reasons why. Under the old rules of Google’s algorithm, many brands adopted the habit of making one page serve a single keyword or phrase, in an effort to. In the world of Google’s Hummingbird update, that’s no longer an essential practice. What content topics have gotten the best results? If one stands out, you might want to infuse more of that topic into your site. This is where the bread and butter used to be in online search, but such is increasingly less and less the case. With the aforementioned Hummingbird update, Google is placing a greater focus on relevance and context than keywords. Whereas just a few years ago, a savvy search engine optimizer could gain an upper hand by cleverly plopping keywords into content, Google now wants search results to be more relevant than that. Google wants searches to be user-friendly to mobile searchers. This places a greater emphasis on long-tail keywords. As a matter of fact, Google’s analytics now hide keywords from view. So all you can learn from the popularity of your old keywords are ways to create longer keyword phrases that searchers might be querying. So if your most successful search string is “graphic design Minneapolis,” for example, you might be able to think of some related, longer search terms that relate to that phrase, and that mobile users might be using. Where does each piece of content fall in the search results? This is a very important metric. For proof, just look at the fallout from the RapGenius debacle recently. Dropping back to the fifth or sixth page sufficiently disrupted the popular site’s business enough to cause a major hoopla in the world of search. Take note. Since you want all of your content to rank favorably in searches, you can make some connections between content that ranks favorably and that which ranks poorly, and make judgments accordingly with the help of the other metrics in the content audit. Moz has pioneered measuring page authority, so they’re your go-to for this metric. Is your content getting shared on social media sites? Do you have a runaway viral success right under your nose? It’s time to figure it out. You can track this easily with most fully-integrated analytics suites (especially with something like HubSpot or Moz), which can find relevant terms and hash tags on social media sites, but you might have to do some additional digging to find all references. Social media is increasingly important, as it plays a role in sales, customer service, and support for more and more businesses all the time. You’ve got have a finger on the pulse of social media to know where your brand stands. This is actually one of the simplest, yet most important, measurements of all in a content audit. Simply put, you need to know how many conversions come from a given page. It’s just that simple; it’s where the rubber meets the road in online branding. This is the other most simple, yet nearly as important, metrics to assess. What content is not working? What’s the rate at which visitors bail out from a particular page? Is there a piece of content that is attracting visitors from searches, but repelling them in short order due to deficient content? If that’s the case, you need to keep the search terms, but change the content. Is a prospective visitor bailing out of the shopping cart to read the frequently asked questions (FAQ) page of your site? That can mean you might be able to offer an answer at the shopping cart, if you can determine the question. Every page has a role in the buying process, and you can learn a lot from how your leads navigate between the pages in your site. You can round them up if the need arises, by moving content around for better results. You are probably looking at each of this metrics individually from time to time. But critically examining them alongside one another can open up new insights. Is that one topic you know to be popular in searches really getting the conversion you are after? Is that little piece of overlooked content that you didn’t personally feel good about converting more than any other page on your site? Once you have finished the daunting task of compiling the data in your content audit, you will begin to analyze it in context. From this, you’ll make determinations and findings. As you work through it, write down any discrepancies you find, as well as any glowing successes within your content. Using this, you can tailor a plan to take action. You will go on to adapt old content that can be salvaged, replace or simply discard that which cannot be saved, and create new content that bears in mind your findings from the content audit. As you look at the data, you will notice trends that emerge. With your goals for the content audit in mind, your task then becomes putting your effort to good use. This may mean a total revamp of the way the buying process works on your website, or it may call for a major departure in the topics covered on your blog. Whatever the case may be, a content audit is only helpful if you follow through with actions based on your findings. Once you know how to conduct a content audit, it’s a good idea to routinely do so on an on-going basis, as we stated at the beginning of this article. Once you’ve made it through one successful content audit, you will have a clear idea of what the process is like, and how to make it run more efficiently in the future. If you have a lot of content and add to it all the time, you can pinpoint ways to make auditing it more efficient. This can also help you choose the how frequently you conduct a content audit. If you operate in a highly dynamic area, you might want to conduct a content audit as often as once per quarter to make sure your content is keeping up with trends. If you don’t generate much content, you can probably afford to audit it as little as once a year. Again, though, you will only know once you have made it through the first content audit. Your business, ultimately, is about growth. You want new opportunities to write business proposals, form partnership agreements, and in general, increase your return on investment. Here’s a bonus tip: if you are using Quote Roller to prepare and send business proposals, you can also factor its in-app analytics into your content audit. By examining a prospective buyer’s actions inside a proposal, you can compare their interactions to your website to uncover any objections that might stand in the way of sealing the deal. And that really underscores the ultimate aim of conducting a content audit: using all of the tools at your disposal to learn how to better invest your efforts. Content may be king, but it’s certainly not cheap. Like everything else in your business, you want to make sure you are getting the most return you can from your content. So use a content audit to your advantage, heed the lessons from what you learn, and grow your business to the heights that you aspire to achieve, by continually improving the content you present to the world. You might be surprised by what you find when you start to examine your website content critically. 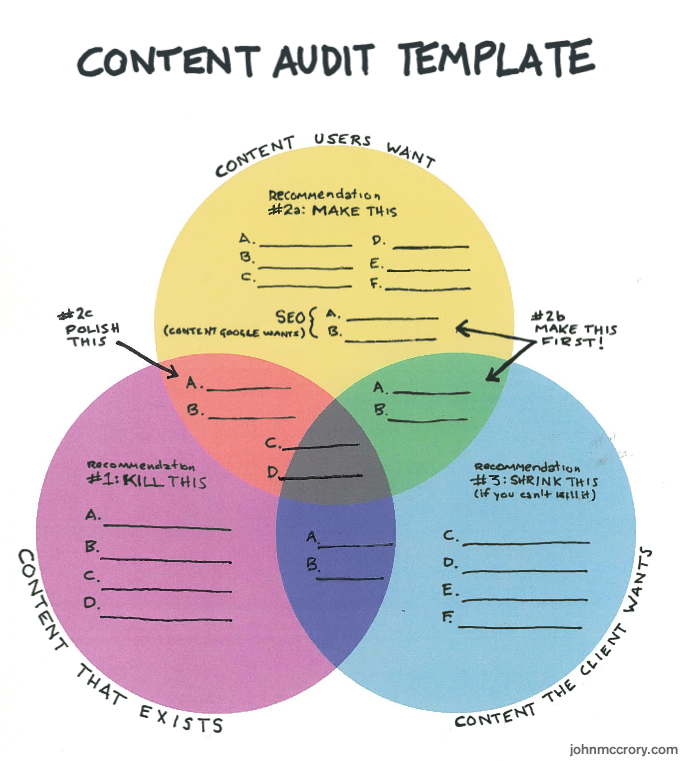 Have you conducted a content audit lately? If so, what did you find? Please share your thoughts in the comment space below.